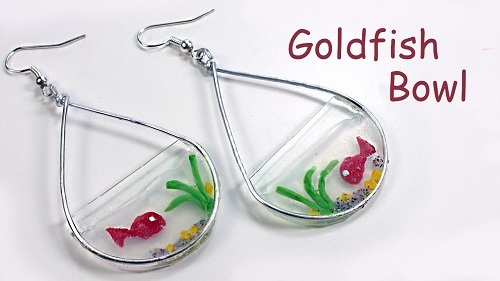 Italian polymer clay artist and instructor's goldfish bowl earrings tutorial is for you if you have some CDs you wish to recycle. Once the shimmery layer is removed, you are left with a transparent plastic material which can be cut up and used as a base. She uses transparent polymer clay as the glue when attaching the CD cutout to the wire frame. This method does result in a thickened back which does not look neat. What I suggest is to make little goldfish etc in polymer clay. Once baked, they can then be embedded in epoxy resin. Remember to first lay the wire frame on packing tape and pour one thin layer of resin. Embed the polymer clay pieces and let the resin cure before adding a second layer. I think her idea is great! What struck me was the transparency. Cd's like this could take the place of expensive mica that doesn't have quite the transparency of these. I've seen projects using mica as a 'window' to look at what's beneath. This idea would greatly improve that. Being someone who struggles with resin this idea works for me! Yes, this is a great alternative to resin! !